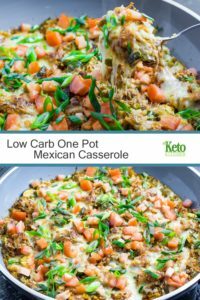 Our Low Carb Casserole Mexican One Pot is delicious and loaded and easy to make. This is one quick dinner that you will want to cook again. It also freezes well for large batches. If you like our Low Carb Casserole try our Low Carb Pork Carnitas and Low Carb Enchilada Sauce. A match made in spice heaven. To Freeze: After broiling, split the Mexican One Pot Low Carb Casserole between heat-proof and freezer-friendly food-safe containers, pop them in the freezer and microwave to defrost when hunger strikes. Place a large non-stick frying pan over medium heat. Add the butter, garlic, and green pepper and saute for 5 minutes. Add the zucchini, salt, and pepper and continue to cook for 3 minutes. 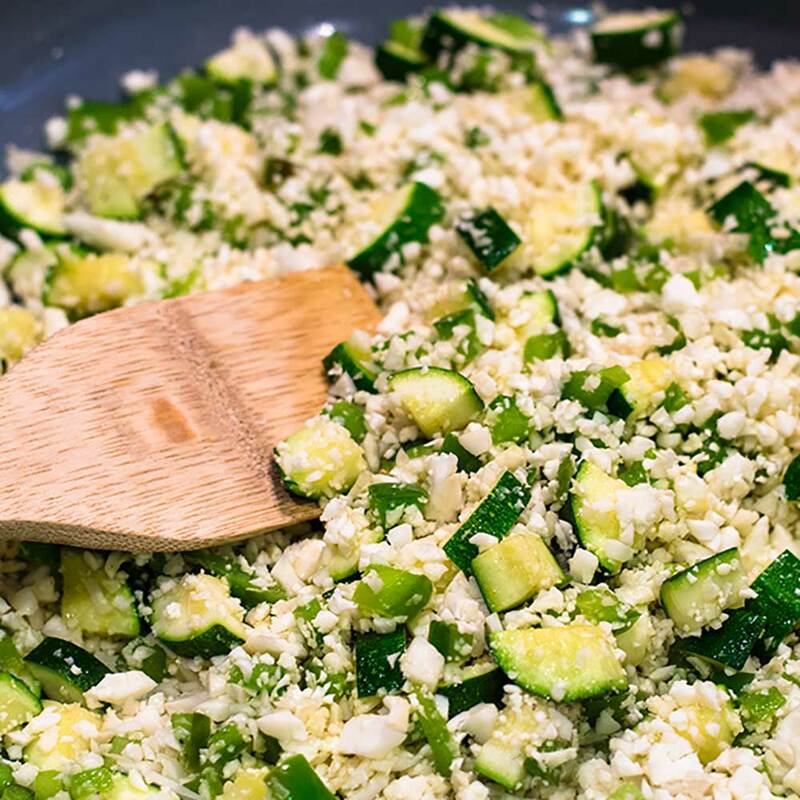 Add the cauliflower rice and continue to cook, whilst stirring for 5 minutes. Add the Low Carb Pork Carnitas and lime juice and stir well before adding the Low Carb Enchilada Sauce. Bring the pan to a simmer and continue to cook for 5 minutes. Sprinkle the cilantro and cheese over the casserole. Remove from the stove top and broil until the cheese had melted. Garnish with the diced tomato and sliced scallions and serve. We recommend serving with sour cream and Sugar-Free Guacamole! 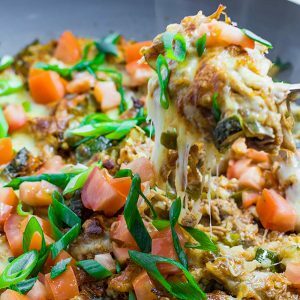 Our Mexican One Pot Low Carb Casserole is a good old comfort food, without the excessive dishes to wash up afterwards. Add the butter, garlic and green pepper and saute for 5 minutes. Add the zucchini, salt and pepper and continue to cook for 3 minutes. 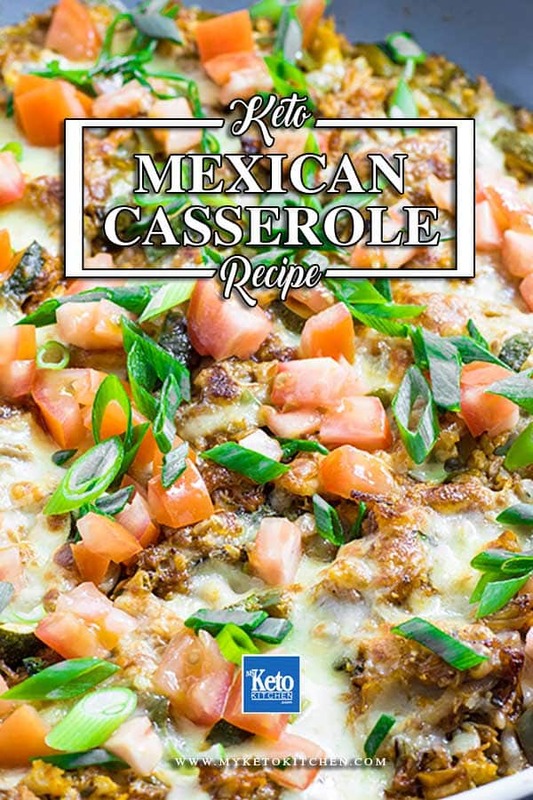 To make a larger batch of this Low Carb Mexican Casserole recipe adjust the serving amounts above.